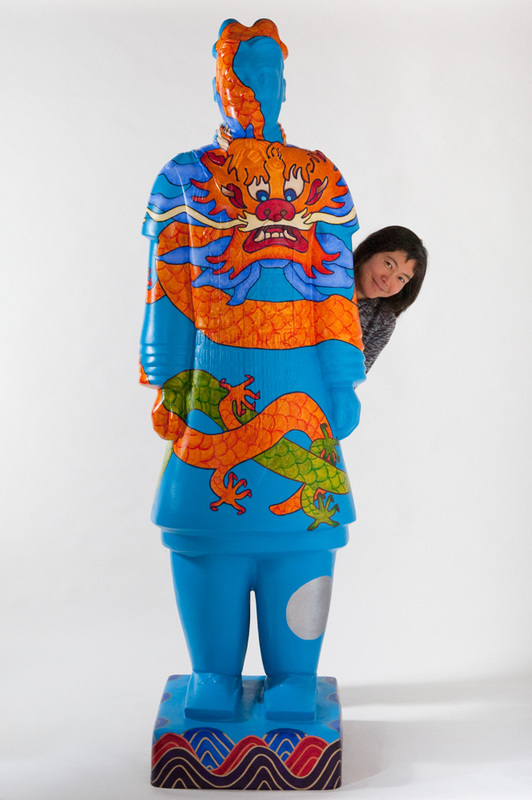 Me with my "Year of the Dragon" Terracotta Warrior painted for a charity auction. UnBlink Studio was founded by me, Jackie Tahara, in beautiful Victoria, British Columbia, Canada, where I am happily surrounded by mountains, forests, beaches and the Pacific Ocean. If I’m not working in my studio, I might be going for a run, eating sushi or Thai phad seeuw, or taking a trip with my family to somewhere we've always wanted to go. I am inspired by: the retro pattern designs of the 50's, 60's and 70's; Scandinavian design; the intricate patterns of William Morris and Josef Frank; and the landscapes, textiles and craft traditions I have seen throughout my extensive international travels (think: aloha shirts, jewel-toned silk saris, Indonesian batiks and weavings, Japanese kimonos, Middle Eastern tile-work, indigo dyeing and Mexican folk art, to name but a few!) My eyes are always open and I intend to never stop learning and exploring. My growing list of clients include: Amber Lotus Publishing, Palphot Marketing, Freeheart Drinkware, Bizjak Farms and Langford Law. My work has also been featured in Uppercase Magazine, MOYO Magazine and on the Print & Pattern Blog. And I am included in the 3rd Edition of the Uppercase Surface Pattern Design Guide (April 2019), featuring "the best in up-and-coming surface pattern designers"! For all my latest news, I invite you to check out my In the Media page and my Blog!